Napoleonic artillery can usually be divided into two types: field, or light artillery which was employed by the armies on campaign and in the field and siege, or heavy artillery, which was employed in siege operations and against opponents holding the fortresses against them. While field artillery consisted of calibers up to and including 12-pounders light enough to keep up with an army on the march and in combat, siege artillery was of the heavier calibers and intended as battering pieces which could destroy fortifications through bombardment. Similar garrison artillery was mounted on different gun carriages and employed to counter the siege operations and siege artillery of the opposing forces. Serving alongside the artillery men the engineer arm displayed its expertise in the various operations needed to take or defend a fortress. Naval artillery would, along with the skill and seamanship of the naval officers and ratings who worked the ships, determine who would be victorious at sea. Naval guns were generally of two types, guns and carronades and ranged in caliber from relatively small 9-pounders to 32-pounders for guns and even larger calibers for the short-ranged and deadly carronades. This volume chronicles the story of the guns and men during the twenty-three years of almost continuous warfare from 1792-1815 from the battlefields of continental Europe to the almost primitive terrain of North America and of the seas, lakes and rivers that connected them. ammunition, and carriages, used by the armies of the era, it is not a dry technical manual. Mr. Kiley writes in a narrative style that places the reader on the ground with the gunners. His vivid descriptions allows the reader to imagine what it must have been liked to maneuver and man the guns in a variety of situations whether on the march or on the battlefield! 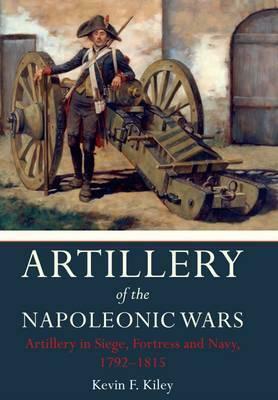 The scope and depth of information in Artillery of the Napoleonic Wars 1792 1815 will satisfy both the serious researcher who is looking for technical information, while the lively narrative will appeal to the casual reader.